San Miguel de Allende is a colorful colonial city nestled in the heart of Mexico. The architecturally rich respite in the Guanajuato state is about a two-and-a-half hour drive from Mexico City, and it boasts a thriving art scene, a fascinating historical center, and a vibrant heritage. A visit here isn’t complete without taking advantage of spa treatments, vegan eats, fitness studios, organic coffee-shop sips, hikes, and green-juice vendors. But somehow, despite all those healthy offerings, the city still manages to fall blissfully under the radar. And after a few days gallivanting around the Mexican gem, you’ll feel enriched, fulfilled, and oh-so healthy. Especially if you follow the guide below. Consider your morning hike found. The steep climb combined with the altitude (more than 6,000 feet above sea level), means you’d be smart to prepare to huff and puff all the way to the top. Considering the amazing view you’ll get as a reward though, you’ll surely feel it was worth the effort. SMA is built on the edge of an extinct volcano that hasn’t erupted in 12,00 years. Thanks to the subterranean volcanic activity, the countryside surrounding the town is full of healing thermal waters and hot springs. My absolute favorite of the several I visited is at Hotel Nirvana. Take a $10 cab ride outside of town and arrive at this little slice of, well, nirvana. 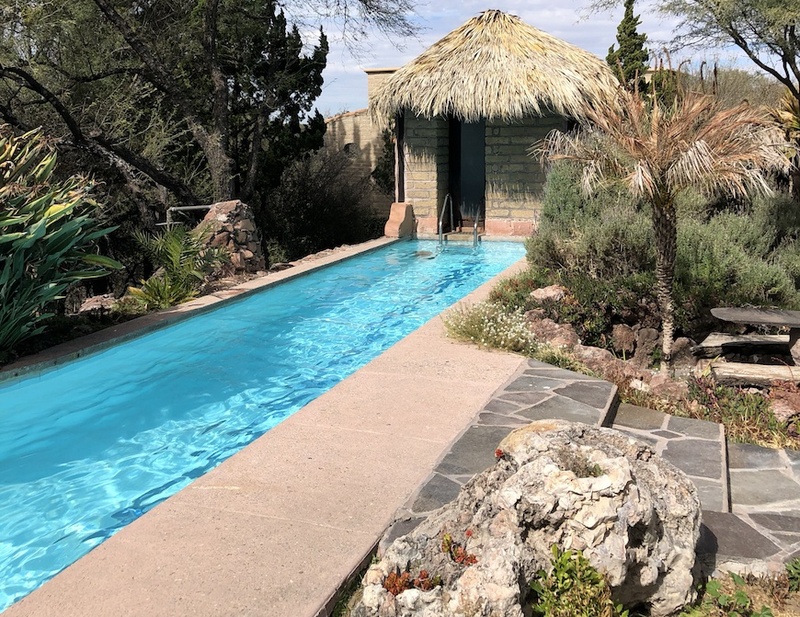 Bathe in the warm thermal pool; sit under the continuous stream of healing water; and enjoy some vitamin D from a perch on one of the welcoming loungers or cabanas. Plan to stay for a farm-to-table meal at the restaurant. The streets of San Miguel are straight-up magic. Make sure to hang in the Jardin—the central garden—a great place to people-watch or meditate amid the beautiful chaos of the bustling crowd. Pop into shops and boutiques, get lost in the Mercado de Artesanias, or stop by my favorite boutique, Mixta, for exquisite souvenirs like hand-loomed robes and kaftans, jewelry, and wall hangings sourced from all across the country. At Mercado Sano, stock up on seasonal produce, snack-board essentials (fresh cheeses, meats, olives), gluten-free baked goods, cold-pressed green juices, and smoothies. On Saturdays, the market expands with vendors from all over the countryside who offer tasty local delicacies—like gorditas (Mexican pita pockets stuffed with meat, cheese, and toppings), tamales (a corn-based dough steamed and wrapped in corn husk), pozole (like a Mexican chicken noodle soup with tortilla in lieu of noodles)—all with a side of live music. Be sure to visit the Les Quiches de Madame la Lune stand, which is run by a Parisian expat who makes the best quiche and cake in town. For a real, literal taste of Mexico, the Tuesday market, El Tienguis, should be at the top of your list. If you look hard enough, you can find just about anything here (including motorcycle parts and pirated DVDs), but special mentions go to the roasted-pork tortas from La Casa de Las Carnitas, the tripe or pastor tacos at Taco Toro El Buffet, and juice from Energia Salud y Rico Sabor Frutal (try the alfalfa/piña blend). And when in doubt, simply wander and try new things. Pro tip: This is also a great place to replace the iPhone charger you left on the plane, try crickets sprinkled with chili powder (naturally paleo and gluten-free), and pick up pounds upon pounds of delicious ripe and sweet fruit or vegetables. Try a reformer ($24), mat ($13), or barre class ($13) at SMA Pilates in the San Antonio neighborhood, located just outside Centro (a 5-minute cab or 20-minute walk). In this residential area, you’ll take off your tourist hat and feel immersed in the local culture. Posada Corazón is a beautiful B&B in the heart of San Miguel de Allende. It serves breakfast through early afternoon and ingredients come from an organic fruit, vegetable, and herb garden—including the house-made herbal tea. Call ahead for a reservation. Souvenir tip: Pick up a few bags of the house-made granola for gifts. Do yourself a favor and head to Génesis Tienda Naturista, a small health-food café, for a vegetarian pita sandwiches and house-made granola that’s free of vegetable oils. Vía Orgánica (also an organic grocer) is a can’t-miss for fresh and healthy fare. It offers a nightly special that includes a mug of house-made, organic beer; a salad; a healthy main like, freshly caught fish or grass-fed steak; and even a little dessert (flourless chocolate cake FTW). 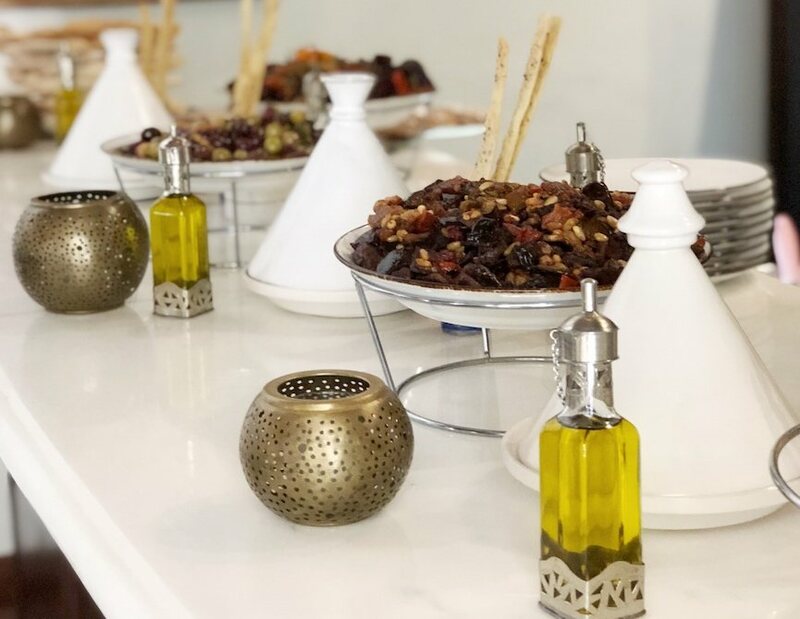 Fatima 7 is a brand-new Middle Eastern–inspired restaurant by Canadian chef Donnie Masterton. Here, choose between three and seven shared dishes, depending on the size of your party. Can’t-miss options include the rich labneh, roasted cauliflower, and fresh-baked pita. Consider Josephine’s your go-to for detox shots, smoothies, and other healthy treats in an edgy part of town that doesn’t feel quite as polished or tourist-laden. And don’t leave before snapping a photo in front of the amazing wall mural #forthegram. Luna Rooftop at The Rosewood boasts expansive views that pair perfectly with the bar’s tasty tapas, like grilled octopus. Go on a Thursday night for great live music and cold local beer. Casa No Name is a stylish boutique hotel that has magical rooftop bar that’s covered in tropical plants and tastefully outfitted with Balinese furniture and art. Gather around the contemporary communal fire pit, and prepare to enjoy one of SMA’s best margaritas. In the battle of the rooftop bars, Quince gets high points for view, vibe and value. Hot tip: Go at sundown—and make sure you have storage on your camera roll. 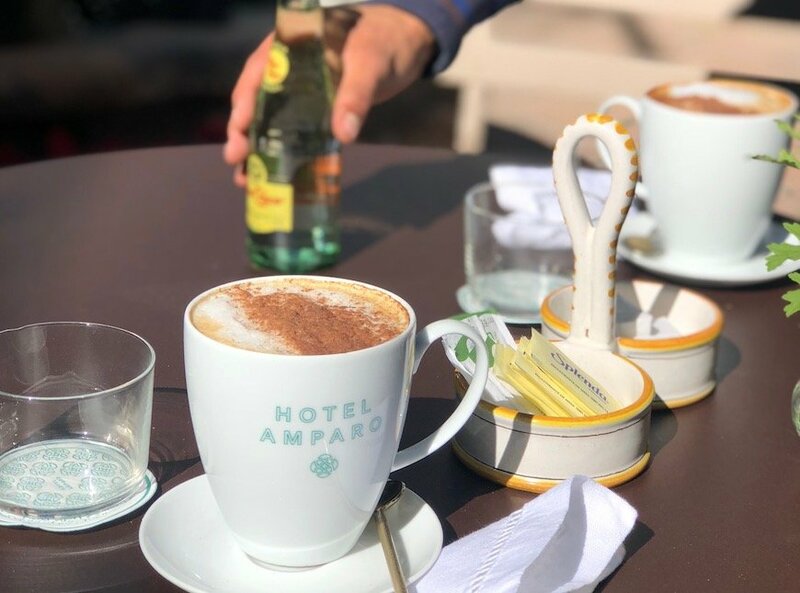 Hotel Amparo is the new kid on the block in a town full of design-conscious places to stay, restaurants, and cafés catering to aesthetes from Mexico City (and beyond). This micro hotel is becoming the unofficial clubhouse for clued-in locals who stop by for its tasty breakfasts and BUNA coffee—one of the best bean roasters and coffee makers in Mexico City, and this is the only place in SMA currently serving it. Grab a table in the sunny courtyard. 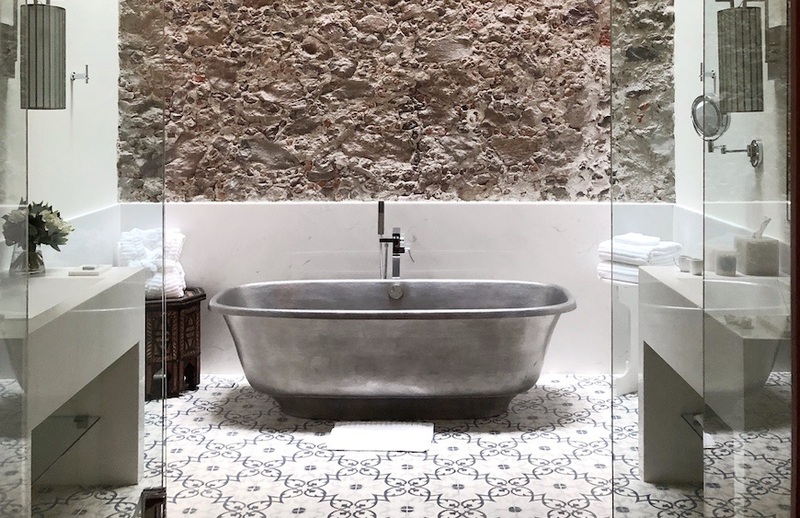 A former three-century-old residence in the historical Centro of San Miguel, this hotel (around $320 per night) is a true oasis from the bustling crowds. Rooms are romantic, with original ceilings that ascend two stories and feature enormous brass bathtubs; in-room spa treatments are available, and its rooftop restaurant, Fatima 7 (see description above), offers some of the best birds-eye views of the town. The Moroccan vibes run deep throughout the space, with a central courtyard that’s reminiscent of a traditional riad (with a tropical touch). With an idyllic location just five minutes from Centro and a stone’s throw from Parque Juarez, (SMA’s small-scale Central Park), it doesn’t get much chicer than a stay at this all-white boutique hotel (around $380 per night). One of the first design-led properties in town, it still holds the crown for stylish stays. Clean lines and neutral interiors offer a stark contrast with the rest of the town’s traditional colorful, colonial buildings. Rooms feature hand-loomed rugs and contemporary finishes like sleek marble bathrooms and luxe linens. Set amid art-filled walls, the courtyard pool is a welcome hangout on hot, dusty days. Hopefully you can reserve a few final hours of your trip to spend in the facility’s award-winning spa to pamper your skin. I love the Hydrating Facial ($100), which includes serums, oils, treatment masks, and gentle hands to restore your skin’s natural barrier while adding elasticity and moisture.